Diabetic retinopathy is probably the most commonly known complication of having diabetes and must be taken seriously as it can lead to blindness. Diabetic retinopathy affects the retina, which is the back of eye. The retina is the part of the eye that converts the light we see into signals which are sent to the brain via the optic nerve, this is then processed by the brain into the images that we see. I. Background diabetic retinopathy – this type is the very early changes to the retina, it doesn’t normally affect sight but must be monitored carefully to ensure it doesn’t become worse. II. Diabetic maculopathy – this type is when the background diabetic retinopathy has developed on or around the macular. The macular is crucial when giving good vision as it provides central vision. Having diabetic maculopathy can affect sight. III. Proliferative diabetic retinopathy – this type is caused when background diabetic retinopathy become worse. When the blood vessels become damaged or blocked in a large area by the above two types it causes a reduced supply of blood to the retina. The body tries to compensate this by growing new vessels on the retina’s surface, but these vessels tend to be very weak and bleed, which in turn can affect the vision. The bleeding also can cause scarring which pulls on the retina, this can cause a retinal detachment. While retinal detachments can be fixed, sometimes this may not be possible, leading to impaired vision or blindness. While developing cataracts is extremely common and a part of the eyes natural aging process, people with diabetes can develop cataracts earlier and faster. Cataracts are caused by the eyes ageing, becoming cloudy and more rigid. Symptoms of cataracts tend to be blurred vision and glare or halos, especially at night time. Cataracts are usually easily removed by undergoing cataract surgery and in its place an artificial intraocular lens is implanted to restore vision. Glaucoma is caused by an increase in the eye’s pressure. Pressure develops when the eye’s fluid cannot be drained as normal. This can then cause damage to the blood vessels and nerves within the eye leading to impaired vision, and if not monitored and treated correctly, can cause blindness. If you have diabetes, you are more likely to develop a rare glaucoma called neovascular glaucoma. This type of rare glaucoma is caused when new blood vessels develop and grow on the iris, which is the coloured part of the eye, and this blocks the normal flow of eye fluid and in turn increases the eye’s internal pressure. While regular types of glaucoma can be treated with eye drops and possible surgery if needed, neovascular glaucoma is difficult to treat and laser surgery or implants may have to be used to control the glaucoma. Blurred vision may be caused by something else, such as cataracts, but when you have diabetes it can sometimes be caused by an imbalance of your blood sugar levels that can easily be rectified. The high blood sugar levels can cause the lens within your eye to swell, which gives a blurry vision effect. To treat this, you may just need to get your blood sugar levels back under control and within limit. It may take a few months for the blurred vision to disappear. If you do develop blurred vision, make an appointment with your GP and optician or eye clinicArticle Submission, so they can make sure it is nothing more serious. 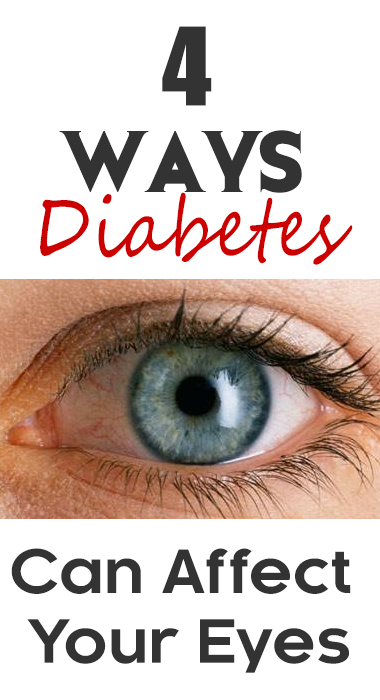 Remember if you have diabetes to get your eyes checked regularly. Everyone over the age of 12 with diabetes should be invited to a yearly diabetic eye screening and it is important not to miss this. Early detection of diabetic eye diseases could save your vision.